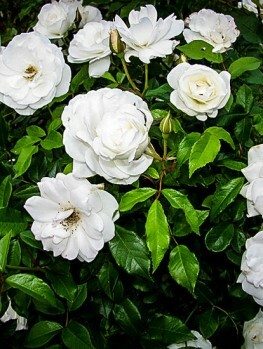 The classic rose remains one of the most popular plants for anyone wanting to create a rich and elegant outdoor view. There are literally thousands of varieties, but the exciting Knockout Rose belongs at the top of the list and now it’s available in a tree-shaped form too. The Knockout Rose Tree is hardy, beautiful and very versatile, and deserves a place in every garden. Providing a summer-long splash of vivid red color, this elegant rose will make a real difference to your garden. 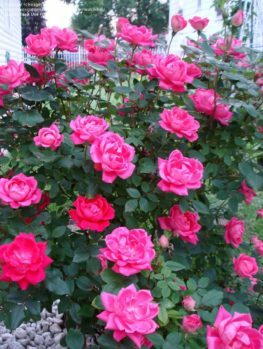 It is longer-blooming, hardier and more resistant to pests and diseases than almost any other rose bush and brings a never-ending cavalcade of blooms to your garden. With its sturdy trunk it will stand proudly above your other low shrubs, or embellish a bed of annual flowers too. 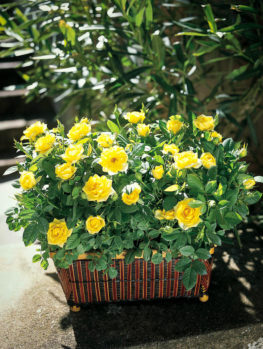 For a spectacular effect, plant between our Double Knockout Rose for split-level beauty all summer long. Roses have come in and out of fashion among gardeners but they’ve always had a loyal following, and today they’re more popular than ever before. There are many good reasons for that. 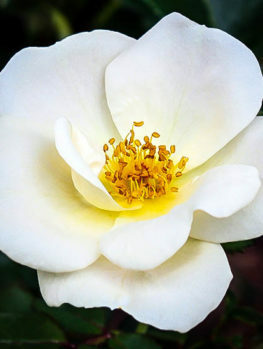 The current variety of roses is larger and more diverse, so there’s a rose for every situation – a formal garden, a naturalized scene, a climber, foundation plants – whatever you want, you can find a rose that will suit. The choice of colors and flowers styles is nothing short of immense. 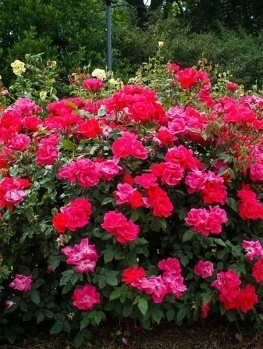 Roses are also some of the most versatile shrubs you can find, as well as some of the most attractive. Of course they can be tricky to grow and that puts many novices – as well as experienced gardeners in areas where conditions are borderline – off them, but with some of the best modern varieties that doesn’t have to be a problem. 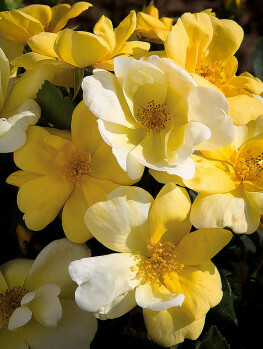 The Knockout range of roses, created by Bill Radler, is already well known for being hardier than most other varieties. It’s particularly resistant to disease and also very easy to grow; you can have an impressive floral display without needing to put in much work beyond the basics. Most Knockout Rose plants are the traditional bushy shape, and they’re available with a good range of single and double flower styles, but this red specimen is a little bit different – it takes the shape of a miniature tree. 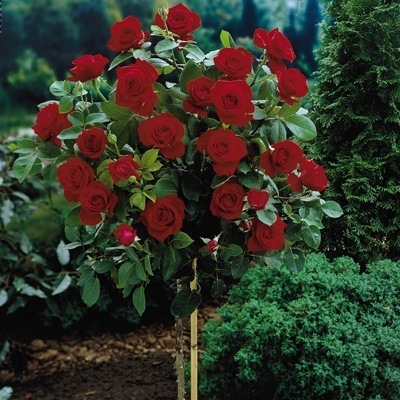 That makes it the perfect way to add some extra interest to your garden while still bringing in the timeless elegance and romantic appeal of a red rose. The Knockout Rose Tree is a fairly large rose bush that grows to between three and four feet in height and about the same across. 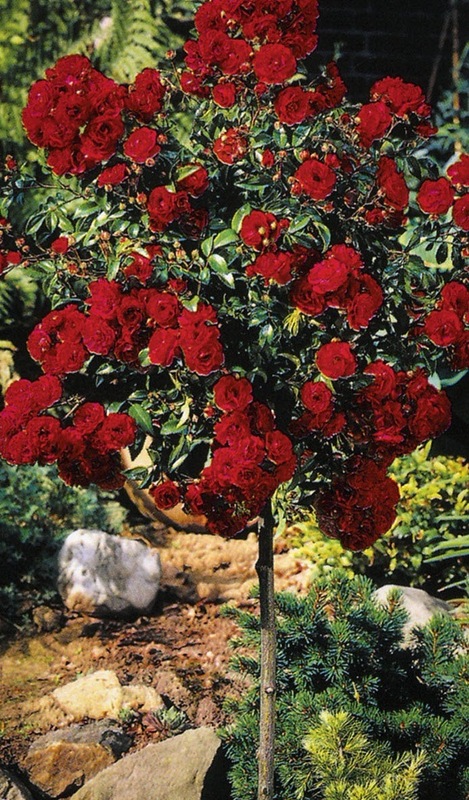 While most other roses grow from a ground level crown, however, and usually split into multiple branching stems, this variety takes the form of a small but perfect tree. A strong central stem reaches upwards before branching out to form a domed crown, with dense foliage consisting of small, dark green leaves that taper to a point. The leaves have a delicate appearance and a glossy upper surface, giving the plant a rich luster. The most noticeable feature, however, is the flowers. These first appear in May or June and are a deep cherry red color. They’re single flowers, so have a simpler – and in many gardeners’ opinion more elegant – appearance than the more familiar, and bulkier, double blooms sported by most modern varieties. The Knockout produces them in abundance, so by early summer the crown of the plant will be densely covered in spectacular blooms. Best of all, however, is the way this crimson show keeps going all through summer and fall. Each flower lasts between four and six weeks before dying, but the tree constantly produces new ones to replace them. 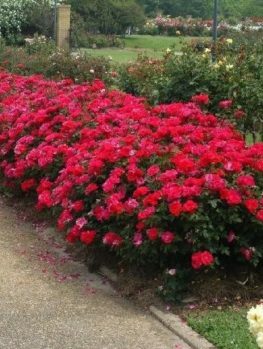 Knockout is a “self-cleaning” rose too – there’s no need to get out there with your cutters for the tedious task of dead heading, because as soon as the flowers die they fall off. The display will continue until the first frost. As fall approaches orange-red hips will appear and the foliage will turn burgundy or even purple, creating a final explosion of color before the plant goes dormant for the winter. Knockout is a tough rose and can be successfully grown in USDA plant hardiness zones 5 through 10. That makes it suitable for just about anywhere in the mainland USA, although there may be a few places in the far north of New England where winters are too cold for it. If you’re towards the colder end of its zone it will benefit from some protection through the hardest weather – a burlap screen will help, for example. Otherwise it’s very resilient, and it’s also tolerant of a wide range of soil. Medium-weight ground with good drainage is ideal but it can also handle less suitable types. Slightly acidic soil will give the best results. Another handy feature of Knockout is that it doesn’t need as much sun as some other varieties to produce its full floral display; three hours a day is usually enough, although full sun certainly won’t hurt. 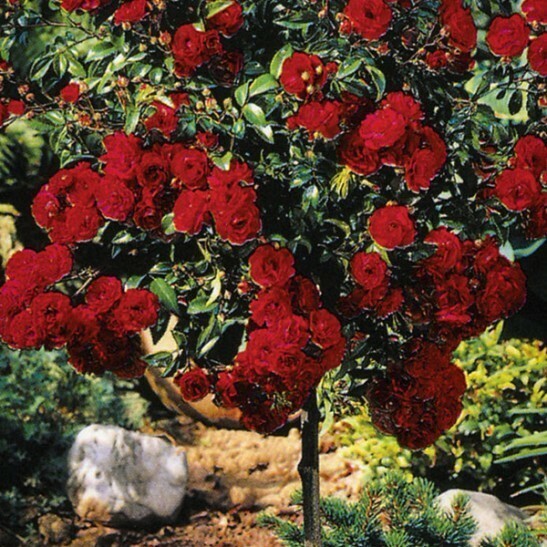 Maintenance of the red Knockout Rose Tree is simple. Because of its form, the main stem doesn’t need pruning, but the branches can be cut back hard in late winter to promote vigorous new growth. Fertilize in the first year, but after that it’s enough to water regularly in hot weather. The variety is quite drought-tolerant, but if the leaves start to lose their gloss it could do with a drink. It’s also a highly disease-resistant species and while all the common rose disease may make an appearance it’s not at all likely. A periodic check for aphids, borers, scale and thrips is a good idea, though. 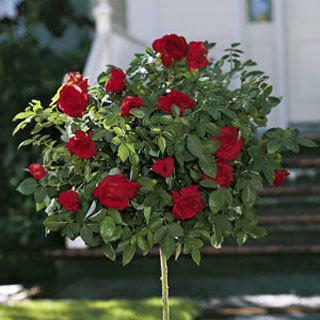 As well as its hardiness and looks, versatility is a real bonus with Knockout Roses. Its form makes the tree version less suitable as a hedge, but it’s ideal as an accent plant or a small centerpiece. The hips will feed a variety of birds in winter and the high crown also makes a good perch for smaller ones. 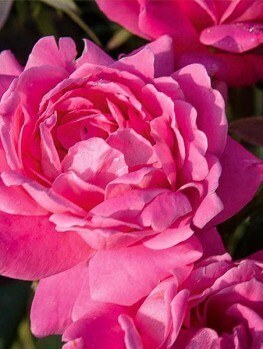 This is an unusual, but beautiful, rose and your garden will be all the richer for having a few in it.